Wholly girl!!!! You are so busy. I love your cuff and I love the atc...Perfect in every way. Betsy and Emma are so darned sweet, nice to have little helpers. Thank you Debby, yes, my litter helpers for sure. They know how to hand out the love! My instructor is Sara and any of her classes are great. You have to do basic 1 and 2 before you can take any of her other classes but they are great. New session starting in Sept. Your affirmation atc is beautiful.... 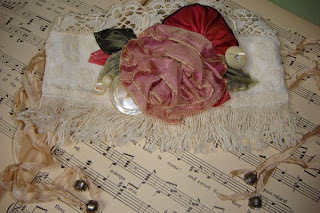 I love the lace - it's so pretty. I have never seen a 'cuff' before, yours is gorgeous. What a beautiful, beautiful photograph of your babies, they are gorgeous , I want to just snuggle with them. My pooch is part Yorkie and he has that little beard, I love it!!!! 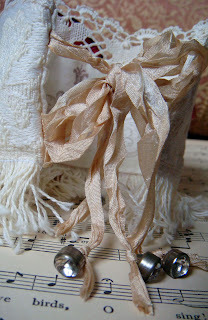 Your cuff is gorgeous too Terri, you make such beautiful things and I didn't know you had just entered this blog world so recently, it's fun isn't it? Thank you Debbie, I am definetly interested! Thank you too for coming over and visiting. Thank you Karen! I had never heard of a cuff before this swap either! If you do a search for "fashion cuffs" you can find some really amazing ones. So you have a little one too? Wonderful! Yes, their little beards are so sweet. Have you posted his photo on your site yet? I will have to go see. 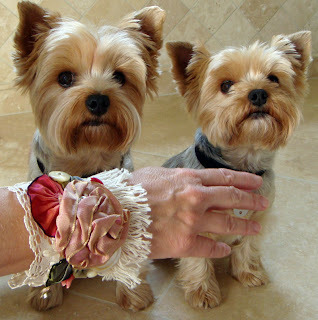 LOVE these doggies and the cuff! Congrats on your recognition on Paper Whimsy-found that by accident. What a cool site. Oh, Betsy and Emma are darling! I used to have a little Yorkie named Digby. Sadly, he was hit by a car--it broke my heart and I still think of him. 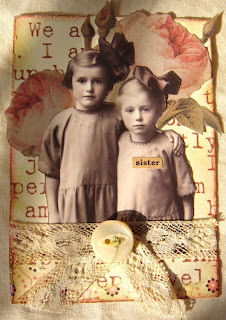 I LOVE what you did with the beautiful cuff, and the ATC is absolutely wonderful--very vintage and sweet!!!!!!! Terri, your cuff is beautiful. I love your two dogs, they are beautiful too. So sweet, thanks for sharing.